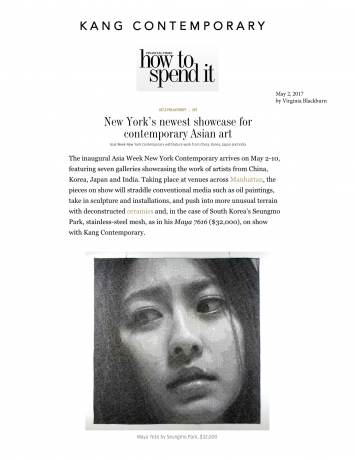 The inaugural Asia Week New York Contemporary arrives on May 2-10, featuring seven galleries showcasing the work of artists from China, Korea, Japan and India. 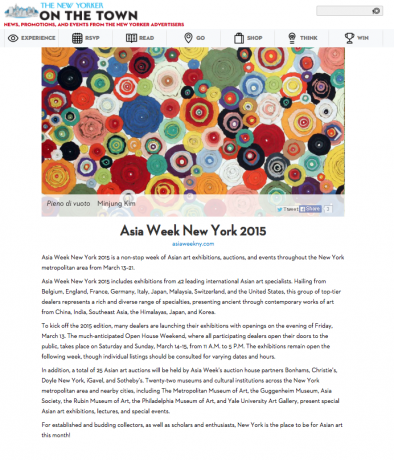 Taking place at venues across Manhattan, the pieces on show will straddle conventional media such as oil paintings, take in sculpture and installations, and push into more unusual terrain with deconstructed ceramics and, in the case of South Korea’s Seungmo Park, stainless-steel mesh, as in his Maya 7616 on show with Kang Contemporary. 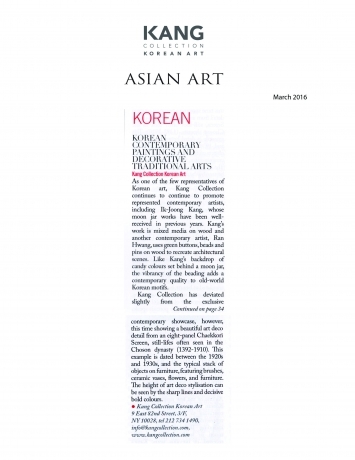 Kang Collection Founder/President Keum Ja Kang Interviewed in Harper's Bazaar (Korea) in April issue. 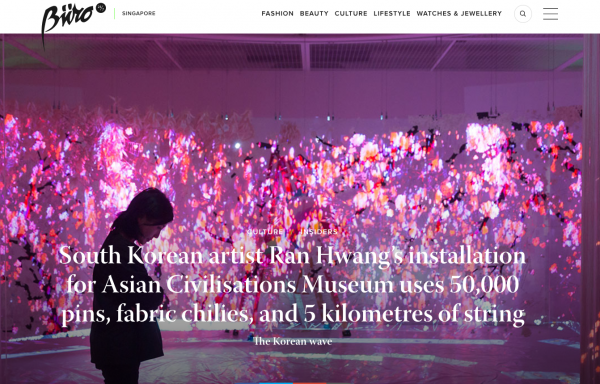 The editor from the magazine, Daye Kim, talked to Mrs. Kang at the gallery about her 35 years of collection. Mrs. Kang shared her memorable experiences with the US Museums. 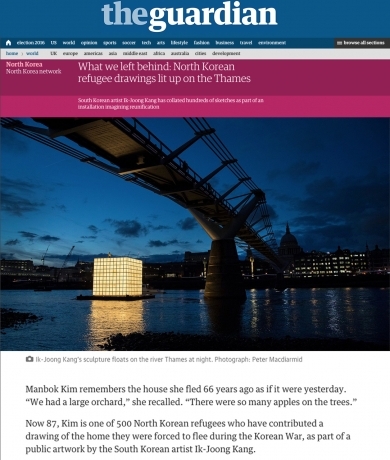 The floating installation by Ik-Joong Kang, part of the Totally Thames festival that opens on Thursday, is a seven-metre-high illuminated cube constructed from hundreds of 70 x 70cm drawings, which were transferred from palm-sized sketches on Korean rice paper. 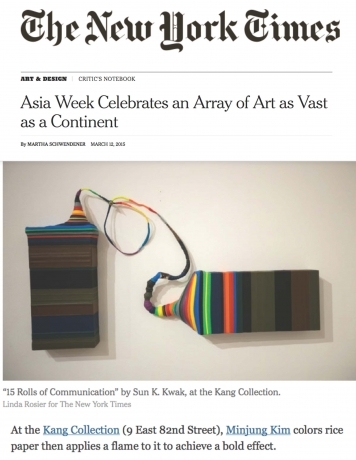 Much of the contemporary art exhibited in Asia Week’s galleries involves recent translations of ancient traditions like calligraphy, scroll painting or ceramics. 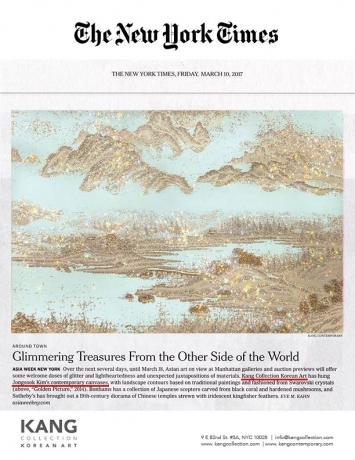 At the Kang Collection (9 East 82nd Street), Minjung Kim colors rice paper then applies a flame to it to achieve a bold effect. 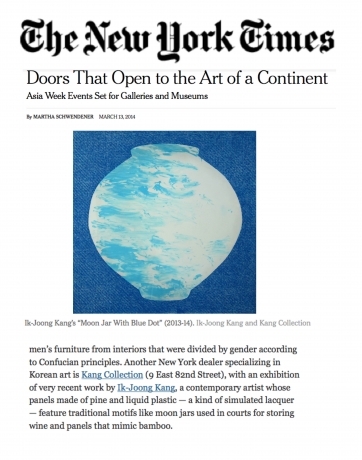 New York dealer specializing in Korean art is Kang Collection (9 East 82nd Street), with an exhibition of very recent work by Ik-Joong Kang, a contemporary artist whose panels made of pine and liquid plastic — a kind of simulated lacquer — feature traditional motifs like moon jars used in courts for storing wine and panels that mimic bamboo.